My name is Louise Schullery Cox. 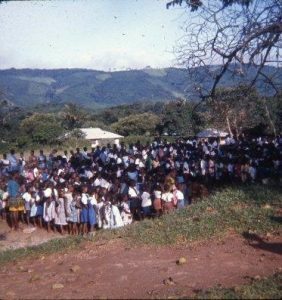 I served in Sierra Leone, West Africa from 1967-1969. I was an elementary school teacher and primary school librarian. I was in high school when the Peace Corps was first�established�under President John F. Kennedy. I lived near Washington, D.C. and was caught up in those exciting times! A friend�s cousin was in one of the first PC groups in Peru and her mom would read his letters to us. I was a freshman in college when JFK was assassinated and on that day, I vowed to try to help make the world a better place. I taught the core subjects and prepared upper level students for their exam; I read stories to classes; I was a member of the community, visiting with neighbors� in the evenings. Many children would come to visit me at home and we�d chat and talk. The village watched over me carefully and I depended upon them too. I have so very many. I loved to watch the Fulani herdsmen bring their cattle home in the evening with the white egrets on their back pecking for insects; I miss the relationships with mothers and children; I invited each teacher and his wives (if he had more than one) for dinner; I saw a red hooded cobra in the garden and was mesmerized at its beauty; the school picnic going through tall elephant grass and cooking stew in a large pot in the bush; crossing the Baffi River during flood in a canoe just like what I saw in the Smithsonian; the gentleness of Sierra Leonians, their big hearts, always willing to share whatever they had; my first Christmas in warm weather. Everyone was so happy on Christmas day; new outfits and no gifts, but they had the JOY of the holiday. The ease in which Christian, Muslim and Animists lived peacefully. I miss it all! I was able to travel throughout East Africa after my first year and throughout Europe upon my return. I am a global citizen and had the privilege of seeing my country from the outside, a true gift. I have seen how people are much more alike than different. I realize how important it is, even crucial, for ALL politicians to have LIVED, not just visited, outside the USA. I realize how isolated the general public is from international news. The world knows and cares about us; we need to do the same. I believe I am a more sensitive teacher after having traveled internationally. Currently, I enjoy teaching ESOL (English for Speakers of Other Languages) students. I consider myself a �Cultural Broker�. This is the toughest job you will ever love! You will find yourself stretched and you will grow. You will learn about yourself and the world in ways not possible otherwise. You may find yourself closer to humanity than you ever imagined. The world�s future depends a great deal on our sensitivity. You will return more resourceful and appreciative for what we have and may well find yourself more creative than you thought possible.